Ultra Music Festival officially concluded this past weekend as its most successful and record-breaking year yet! 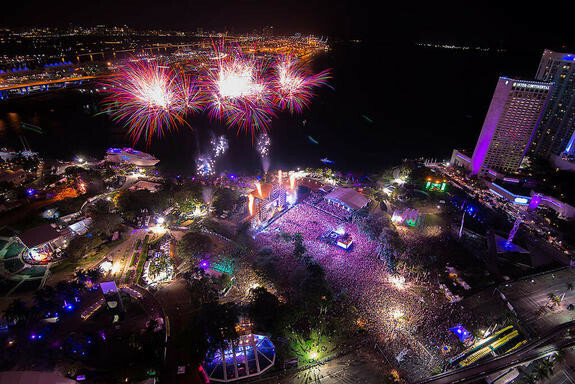 More than 330,000 electronic and live music enthusiasts descended upon downtown Miami’s transformed Bayfront Park to attend the annual event, which took place over two weekends for the first time in its 15-year history. For the first time ever, all six days of the event were streamed live over the internet via Ultra’s official YouTube channel UMF TV, in a broadcast which saw over 200 of the world’s leading DJs and electronic musicians watched by an audience of over 10 million unique viewers from all corners of the globe – officially making it the most viewed festival event in North America to date! Arguably the most notable climax of the festival was the last ever show from Swedish House Mafia. This final performance, full to the brim with mind-frazzling lights and pyrotechnics, state-of-the-art dynamic visuals, a back catalogue of their greatest hits new and old was in turn watched online by over 200,000 concurrent fans worldwide. This figure has now been officially declared by YouTube as the highest concurrent number of views for any US non-sponsored music stream! Another new addition was the Live Stage and its talent, with live performances from the likes of Dog Blood, Azealia Banks, Snoop Dogg, Disclosure, Krewella, The Weeknd, Pretty Lights, Faithless, Booka Shade, Hot Chip, Crystal Castles, and many more. Other memorable moments included deadmau5’s return to Ultra with his stunning ‘Cube’ live show; Avicii’s second weekend performance on the main-stage, in which he debuted brand new material from his upcoming album and the surprise appearance of Grammy-winning guitarist Slash, who joined Dirty Dutch front-runner Chuckie during his main stage set for a live performance of their collaboration ‘Rocktronica’. Ultra Music Festival has also announced that they will return next year from March 28th-30th, 2014. The next installment from Ultra Worldwide comes in the form of Ultra Ibiza in May 2013.